The TV series is about a schoolgirl born in Kibera whose passion is music, but unfortunately, she has no avenues to learn it. She has a talent that even she doesn’t understand. Whenever there’s music, Zuki cannot only hear it, she can see it. But living in the slums of Kibera, there isn’t much she can do about it. 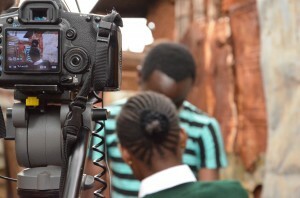 One is grateful to get even a basic education in Kibera. Getting any kind of extra-curricular experience in things like music, sports, art, film or theater is a pure luxury. Unfortunately these may just be the subjects that lead to a career for many of these students. Zuki’s story is the story of many. She, however, finds her means and pursues music behind her mothers’ back. The story of Zuki is not just familiar to learners from poor backgrounds. The majority of pupils in Kenya do not have the time and opportunity to pursue extra-curricular activities. I believe that a good education, irrespective of the subject one has studied, should result in an empowered individual: someone able to use skills acquired to find their way around the next journey of their life. Every stage of education should hand one the tools to navigate successfully to the next stage of education, or life. What happens, though, is somehow the opposite. Education here kills creativity. One is overwhelmed with theories, and at the end of it all, one walks away desolate and none the wiser. Our system of education prepares us for office jobs. Only recently a few other courses such as entrepreneurship were introduced. Since we cannot all work in the corner office with glass windows, what should the rest of us do? Besides the education system, our parents also have a hand in deciding what we study, as they are the ones who pay the fees. Most of them are keen to invest in subjects such as science and math – subjects that are considered lucrative. After secondary school, anyone should be able to apply skills learned. This is not the case, though, particularly for students in disadvantaged societies. A post-secondary education is not very common. Parents argue that educating a child until the secondary level is enough, especially when they have other younger children. The parents feel that instead of one child using the few resources that they have, the other kids should have a chance, too. Most of the students at Filamujuani have finished formal secondary school education after which neither they nor their parents know what they should do. Filamujuani offers those interested in media and film the chance to acquire skills in these areas, earn money and, with time, impart the same knowledge to others. Watching the students call the shots recently was fulfilling. I feel it is time they imparted the same knowledge to others.